Os grid reference: SJ 4052 8757. Inside the palm house of the Calderstones Park Botanical Gardens at Allerton, Merseyside (originally in the county of Lancashire), stand 6 prehistoric megaliths known as The Calderstones, or the Caldwaye Stones, which are said to have come from a burial mound in the Allerton area back in the 1840s, although there is a record of them as far back as 1568 when they were being used as boundary markers and, at that time there were only three of them on view; the other three stones were excavated in the mid-19th century. These stones are thought to have ‘once circled’ the low mound which apparently had a burial chamber, or possibly a passage-grave at its centre. They are of interest, also, because they have carvings (rock-art) on them. 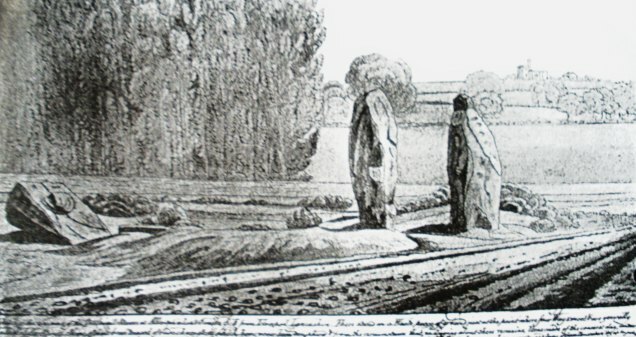 The six standing stones, as they have always been referred to, were eventually brought to the Palm House in Calderstones Park, having stood near the entrance on Calderstones road (A562) and, opposite the aptly-named Druids Cross road. Liverpool city centre is 1 mile to the east. The six stones range in height between 3-8 feet and probably date from the Bronze-Age. They are made of a hard sandstone. Of great interest are the carvings on them, there are a number of cup-and-ring marks on each one as well as spirals, and some other carvings that are more uncertain. When the mound at Allerton was excavated clay urns containing cremated bones and other artefacts were found, according to Mr W.A.Herdman in his work ‘A Contribution To The History of The Calder Stones near Liverpool’ (1896), adding credence to the probability that this was a burial chamber or passage-grave, but it could well have been a cairn circle due to the very fact that ‘these’ six megaliths had been discovered here; the stones would have almost certainly surrounded the chamber within the low burial mound (tumulus). In 1845 the six Calder Stones were re-erected at the entrance to the park, and in 1864 they were examined by Sir James Simpson who declared them to be ‘part of a stone circle’; it was Sir James who identified the cup-marks and spirals and also wrote about them in 1865-7. 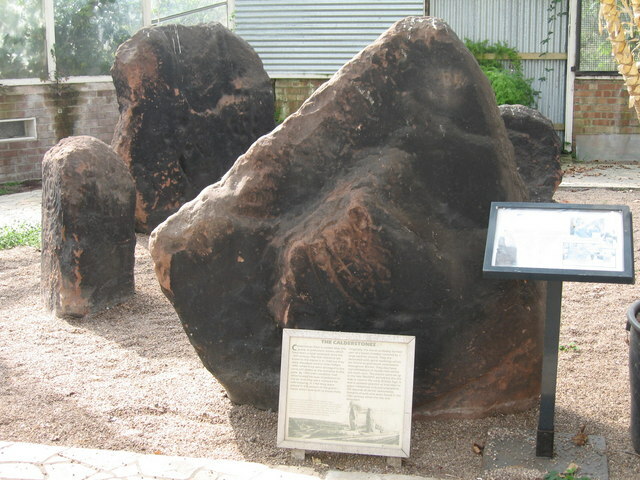 In 1964 the stones were re-housed inside the Palm House (also called the Harthill Greenhouses), and here they stand as a fitting tribute to the antiquarians who discovered them back in the Victorian age. Photo credit: Sue Adair (Geograph) © Copyright Sue Adair and licensed for reuse under this Creative Commons Licence. Herdman, W.A., “A Contibution To The History of The Calderstones, near Liverpool”, Proceedings & Transactions of the Liverpool Biological Society, volume 11, 1896. Simpson, James., “On the cup-cuttings and ring-cuttings on the Calderstones, near Liverpool”, Proceedings & Transactions of the Liverpool Biological Society, Volume 17, 1865. Categories: Misc Subjects, Standing Stones | Tags: The Calderstones at Allerton in Merseyside, The Calderstones in Calderstones Park at Allerton near Liverpool | Permalink.